Many, if not most, of us would like to make money in the music business. There is a very important factor that must be determined: Your artistic definition. In other words, who are you, and why would I want to listen to the music you make? How do you become unique? By becoming in touch with, and being able to express, your authenticity. You are the only one who has your physical instrument (larynx, resonation surfaces, physical stamina, etc) AND who has your life history and emotional experiences. And here's an important fact: There is no competition with uniqueness. Talent shows won't tell you the truth- they can't. Imagine a competition show for an orange, an orangutan and a bedpost. Each has its place, its audience and its detractors. How do you judge such a contest? Your sound has to do with things like your choices or instrumentation, mics, studios and mixes and your vocal technique habits and quirky embellishments. 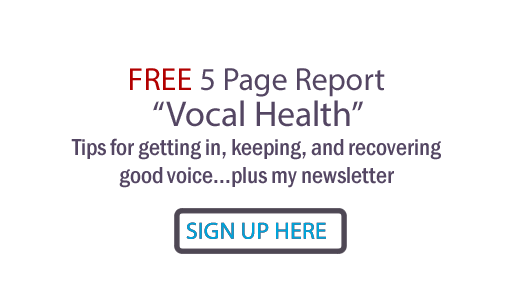 You can change your sound... and that change should have to do with things like accessing your full resonance, making sure vocal lics are appropriate and choosing a sound that communicates most authentically your message. What have you got to say to the world? How do you give your original slant to those thoughts? What do you want the over-arching take-away to be from your audience to your show? Are you willing to do the work? It takes time, experimentation and luck to find a financially viable artistic definition in the music business. Jim Croce could not get the attention of his producer and friend Tommy West until finally one year he began to bring in songs like "Time In A Bottle", "Bad Bad Leroy Brown", etc. Tommy West recognized the hit potential of the new material, agreed to take Croce into the studio... the rest is history. It had just taken time for Croce to find his artistic definition. Keith Urban could not get the audience attention until the audience tastes caught up with him. I did background vocals on his first Bluebird Cafe show; we only got polite applause but nothing like the massive response he gets now. And he is playing guitar and singing a lot like he started out. This took luck and persistance- and belief that the market would find him someday. Your choices to practice, experiment and get better. Operating from a fear standpoint. Afraid too be too out of the box or too traditional. Safe, middle-of-the-road music is usually... boring. Listening to too many people, or not enough, when determining who you are as an artist. Giving up too soon. Disheartened, Alan Jackson was about to board a plane at the Nashville airport back to where he came from. I forget who stopped him; I think it was Glen Campbell. But he decided to give it another try, and finally his very clear artistic definition payed off. Ani Difranco decided to do it her way completely... and started Righteous Babe Record label to get not only her music out but also to sign and give exposure to other music mavericks.